Did you know that in April the day length is the same as in September? That means if there is shade in April, there also will be just as much shade in September. In fact, there might be even more. Trees are not having leaves in April, but they do in September. It is a good idea to do a shade survey in April to see how much shade the garden area will actually have. In order to plan your garden for optimal yield you need to know your sunshine conditions. For a vegetable garden you want to have at least 6 hours of direct sunlight. Some plants need even more. The ideal garden should have morning and midday sun and some shelter from the afternoon sun. In cooler climates, it is good to have sunshine all day. If you only have morning sun, you can still grow lettuce, herbs, radishes, peas, and other cold-weather plants. If you have a lot of afternoon and evening sun, then the place is better suited for warm-weather plants, such as tomatoes and zucchini. Even if you do not have the optimum solar conditions, you can still grow a garden. Unfortunately, a cold climate garden in total shade will not produce. There are many ways to do a shade survey. You can take pictures every hour of the main garden area. It is an easy way to see how the shade is moving. It will help you to know where there will be more or less shade at the end of the growing season. The farther north you are, the bigger will be the difference between how much shade you get in early spring and fall comparing to mid summer. Or you can make a simple drawing of your lot and garden area and mark every hour where there is sunshine. So the most colorful spots are the sunniest. I am very glad I took the time to do this. I had a few surprises. I always thought that the back of our back yard is the sunniest, it is not. It is the front of our back yard and part of the driveway that has the most sunshine. Also there are places in the front yard that have 8 hours of sunshine, I thought there weren’t even 6. This definitely will be helpful when planning the garden to replace the lawn with food production. Use micro climates: Windbreaks will make the spot warmer, good for cold climate gardens. A slight slope to the sun will work for you but a slope away from the sun will work against you. You want to catch every sunbeam you can. Also raised beds help to warm up the soil. See How to Create a New Garden Bed. For heat loving plants you will need a greenhouse located in the sunniest location in your garden. See what greenhouse to choose. I am proud of you, congrats! No shade in Florida could get a bit warm though ;). I’ve never thought of taking pictures every hour in order to do a shade survey. Great info! I missed you. Hope your Easter break was fun! I did have a good break, thank you! Now back to gardening and blogging. That is like us. The snow just melted here (almost all of it ;)), so fun finally to see the garden. Hope you find the right spot, happy to be of some help. I’ve heard of shade surveys before but never thought to do one, but after seeing your results and reading about how you where surprised with them, I’m thinking it might be a good idea for me to do this. Yes, I was surprised and am very happy I did this before making any plans. 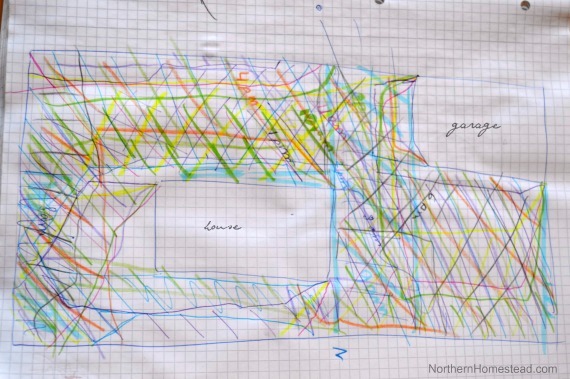 Now for the fun part of planning and actually designing the garden. I would recommend to do this. That is some intense work there – we have the unfortunate backyard facing South/East so most of it is covered in shade by 3pm. However, we have a nice warm climate so it’s okay with us. We still have not put in our garden, but when we do it will be raised because of our sun issue. East sun is good, and like you say a warm climate is more forgiving. happy gardening! What a wonderful idea to conduct a shade survey! That was very interesting. We may need to consider doing that in our yard as we have lots of trees! The sun rises on the back of our home and sets in the front. I would prefer those were east/west for heating and cooling of the home. Someday, maybe we could build a house taking all of those things into consideration! Good information to have, thanks Anna! You are welcome. To build a house where everything is just perfect would be great. I need to do a shade survey of my property this year. There are areas that get so much sun early in the season but are shaded later when the sun shifts as the season progress. These areas would be ideal for planting greens such as lettuce and chard that don’t need full sun. Thank you for sharing at Green Thumb Thursday! You are welcome, thank you for hosting! 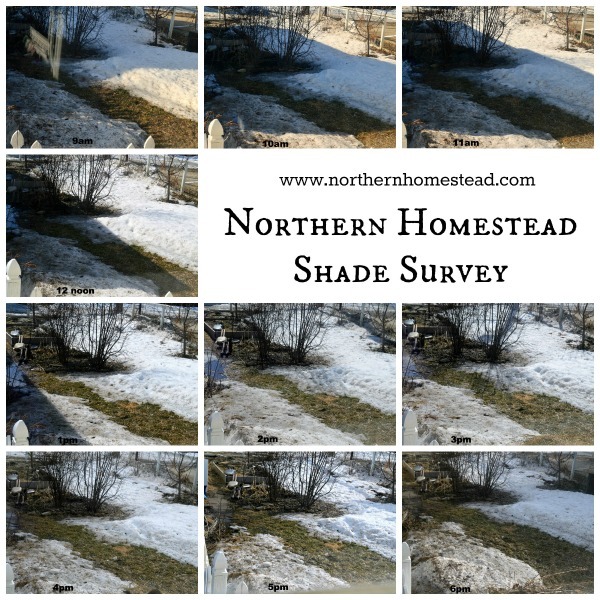 A shade survey is very helpful in planning a garden, no surprises, as the season progresses. Very helpful. I need to do this in a few areas on our acreage. Thanks for sharing at Green Thumb Thursday. It could help you to have a better garden. have fun gardening!